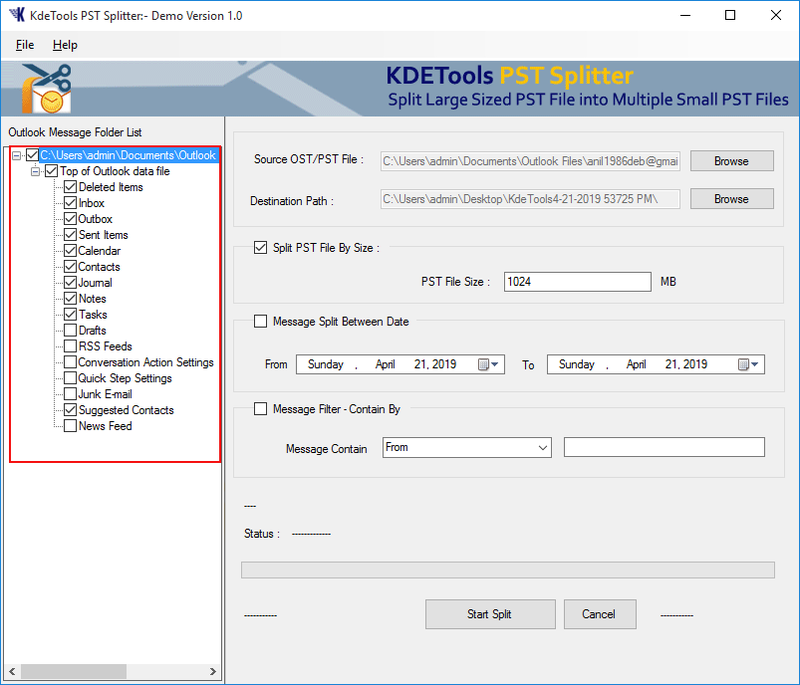 Split Outlook PST/OST file by Date, Size, and Folder. 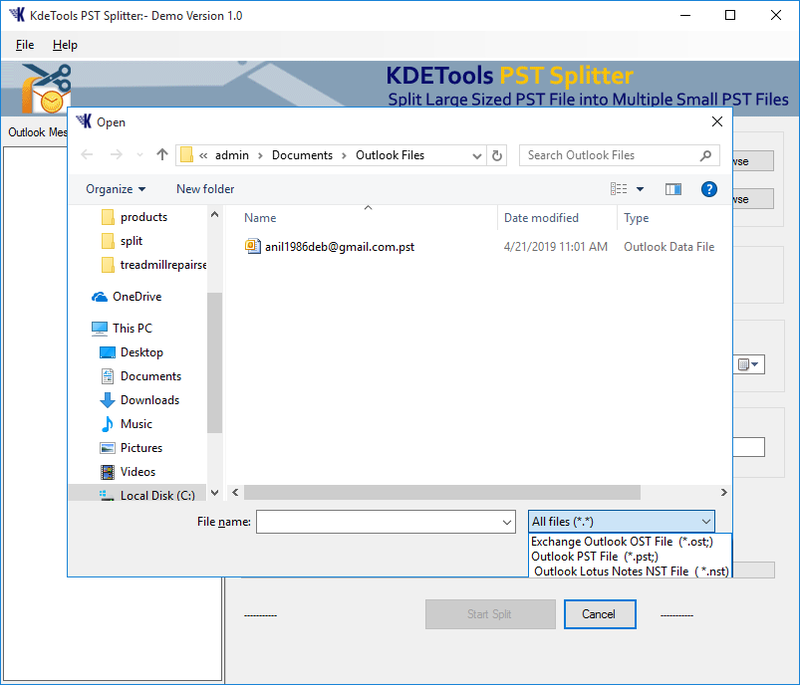 Split large sized Outlook PST file into smaller parts by Date, Size, and Folder. Software does not alter any information hold by PST file. Software supports to recover and split corrupted, password-protected, and encrypted files. Split all items of Outloo PST: Mail, Contacts, Calendar, Tasks, Notes, etc. Split both ANSI and Unicode type PST file. *Trial version will export only first 30 items from each folder of Outlook PST file. 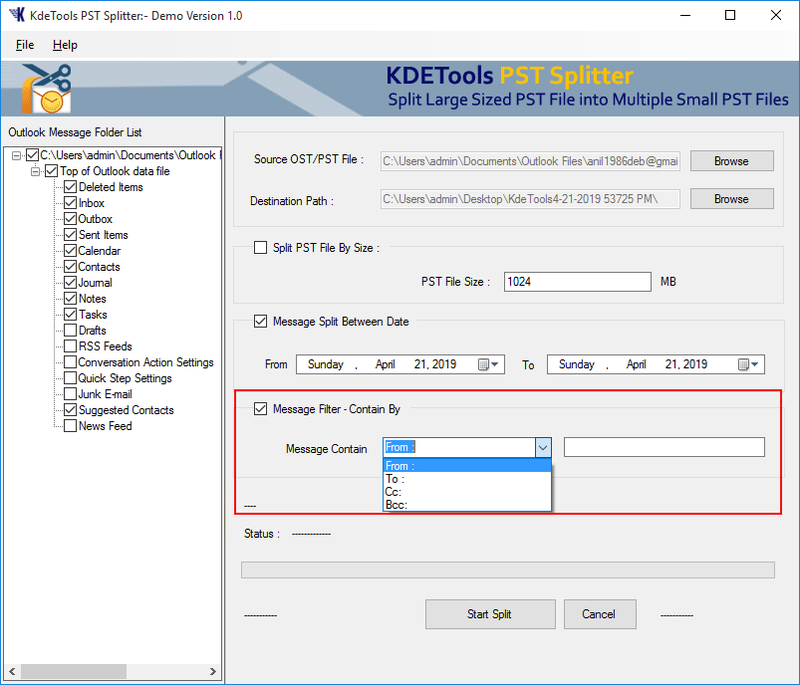 Outlook PST Splitter is the perfect solution to split Outlook data file/ archive file. It splits complete PST items such as Mail, Contacts, Calendar, Journals, Tasks, Notes, etc. No metadata properties will be altered during splitting process. Split large sized Outlook PST file by size. You just need to enter the size of required file and the software will split whole PST file as per command. You can also split specific folder of PST file by size. 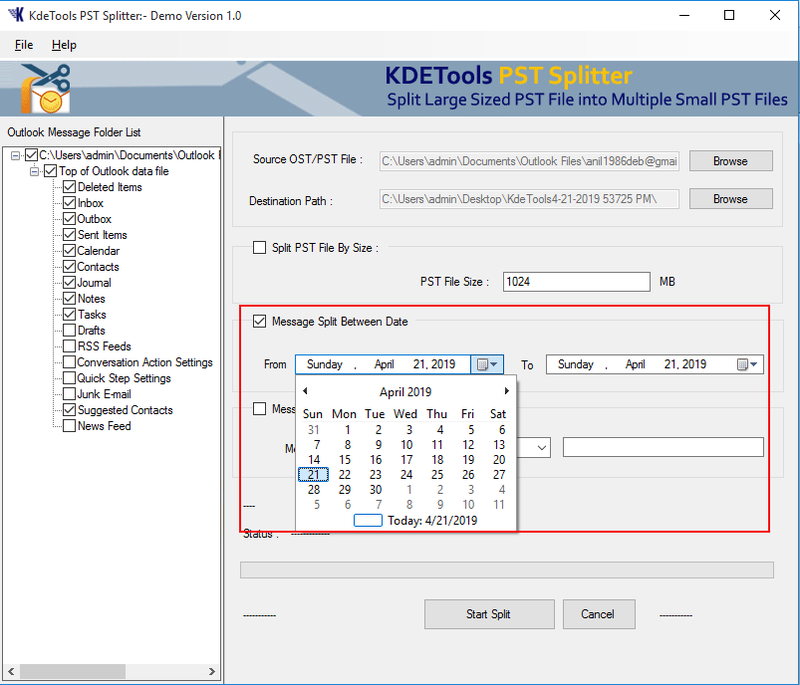 Software splits Outlook PST file by date. You can use this option to divide large sized Outlook PST file by specific date range. By using this option, you can also export a specific folder by splitting as per given date range. There is also an option by which you can export all folders of PST file separately. By using this option, you can create new PST file for each folder without any kind of alteration in original meta properties. 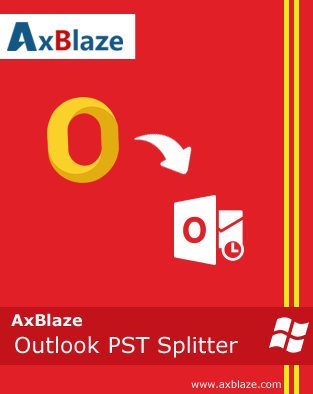 Outlook PST Splitter by Axblaze has ability to repair and split corruptetd/damaged, password-protected, and highly encrypted Outlook PST file. Software can easily remove all types of PST corruption. Software has an extra added benefit by which users can filter messages by From, To, Cc, Bcc. This option allows users to save splitted PST file as per these options. Now, it is easy to export only specific emails as per sender's/receiver's details. 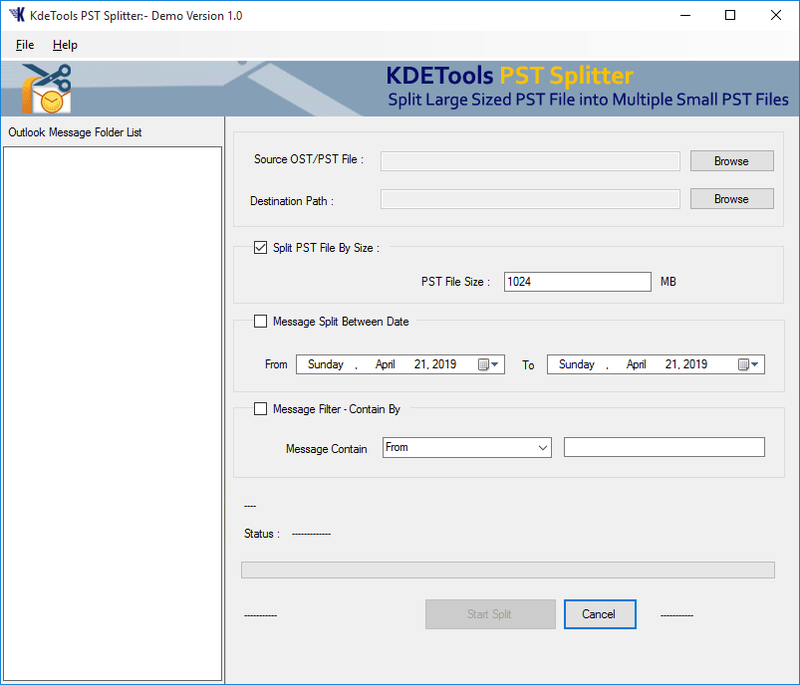 Check screenshots or step by step software guide to split PST file. 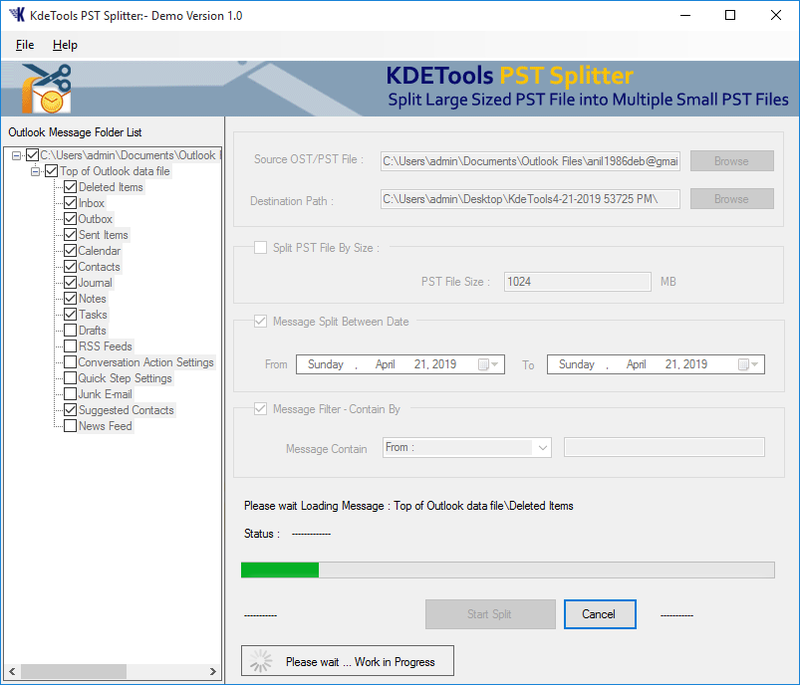 Step 1: Download, Install, and Run PST Splitter. Step 2: Browse PST file. In this step, make sure you are selected "All Files(*. *)" option as given in below screenshot. Step 3: Now, select destination path and choose required option to split PST. 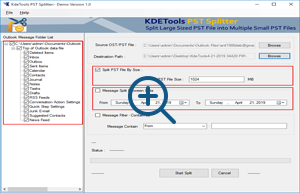 To split PST file by folder, select desired folder(s) from left pane and go to next step. 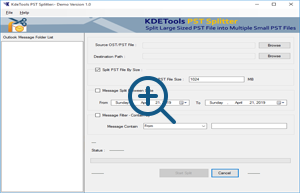 Step 4: To split PST by Size, select checkbox with labelled "Split PST file by Size" and enter desired file size and go to next step. 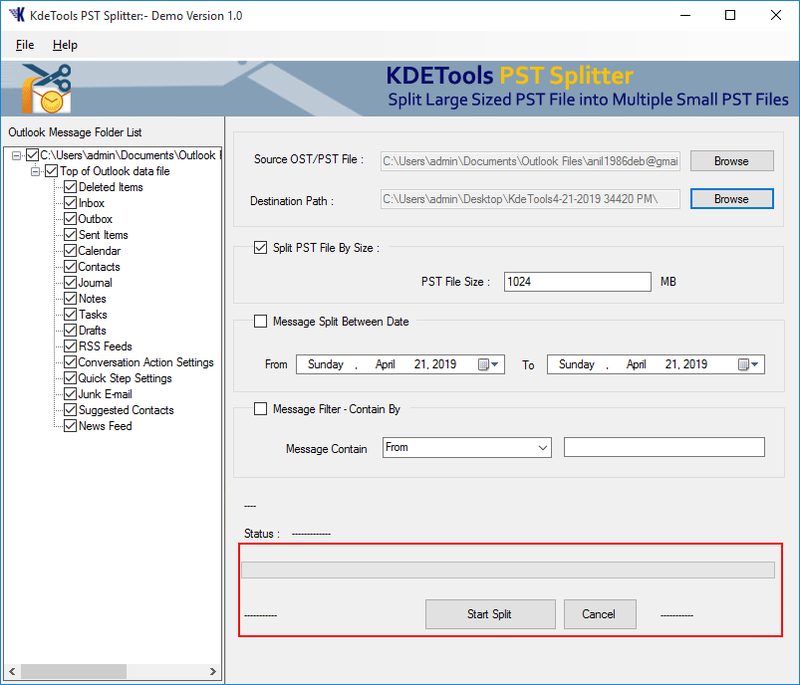 Step 5: To split PST by Date, select checkbox with labelled "Messages Split Between Date" and select desired date range and go to next step. Step 6: In this step, you will have option to filter messages contained by From, To, Cc, Bcc. Now, you can export messages from a specific address. Step 7: In the last step, click on "Start Split" button to split PST file as per given commands. *Freeware version of software enables you to split and export first 30 items.